Story of Karaikal Ammaiyar is an example of unwavering devotion. Young Punitavati lived in Karaikal with her husband Paramadhattan. Punitavati was an ardent devotee of Lord Shiva. Once, her husband sent two mangoes from his workplace. Soon a hungry sage appeared at the door and as food was yet to be prepared, Punitavati gave him one of the mangoes. In the evening, Paramadhattan wanted to eat the mangoes. The first one was so tasty that he asked for the second too. A helpless Punitavati prayed to the Lord. Miraculously a fruit fell into her palms. Her husband ate the fruit and wanted to know how the mango tasted different from the first one. Punitavati then told him the truth. Her husband then asked her to get more of the sweet mangoes. Punitavati again prayed to Lord Shiva. A mango appeared again but when Paramadhattan attempted to eat it, the fruit disappeared. Paramadhattan was rattled by the experience, got scared, and he ran away from home. 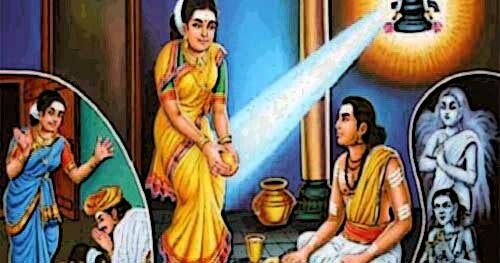 A puzzled Punitavati continued with her prayers to Lord Shiva and waited for her husband to return. Soon her relatives discovered that Paramadhattan was living in another region, and he had got married. Relatives then took Punitavati to Paramadhattan. On seeing Punitavati, Paramadhattan was overwhelmed by devotion; and fell at her feet addressing her as Mother Goddess. A stunned Punitavati prayed to Lord Shiva and asked him to make her a spirit (Shiva Bhutagana) so that she can wander around singing the praises of Shiva, her true Lord. She prayed to take away her beauty and youthhood. Shiva could not deny the wish of his ardent devotee. Her flesh melted away and soon the beautiful Punitavati was turned into an ugly looking figure - with lean breasts and shrivelled skin. After the transformation, Punitavati was no longer the beautiful woman she used to be. Shiva addressed her as Karaikal Ammaiyar. The crowd who witnessed this miracle called her Peyar. Shiva ganas praised her glory and flowers rained from the heaven. Having achieved freedom from body, Punitavati sang hymns in praise of Shiva. Her verses were pregnant with meaning and condemning the materialistic life. It talked only about ultimate bliss - Shiva. Punitavati now set out on a pilgrimage to Mount Kailash, the abode of Shiva. But on reaching the foothill of Mount Kailash, she thought it unworthy to climb the holy mountain with her feet. She used her hands to climb the mountain ensuring that her feet did not touch the mountain. Goddess Parvati wanted to know who was this extraordinary devotee. Shiva told Goddess Parvati that She was His Mother. Shiva welcomed Punitavati by calling her Mother (Ammai). She responded back by calling Shiva as Father. When Shiva asked her what she wanted, Karaikal Ammaiyar only wanted to be the dust in the lotus feet of Shiva. She wanted to worship Shiva when he performs the cosmic dance. Shiva asked Karaikal Ammaiyar to go to Alankadu and promised her that he will perform Urdhva Tandava there with Goddess Kali. Karaikal Ammaiyar took residence here and witnessed the Urdhva Tandava of Shiva.